Even though you never know when the next volcano might erupt, if you’re going on holiday in the coming months, you shouldn’t let this stop your preparations in the quest to be the ultimate beach babe! There are always those who start to panic a week before they’re due to go away- having left those all important preparations until the very last minute! To make sure this isn’t you, and in order to feel as confident as possible when you’re soaking up those gorgeous rays on a beautiful beach, you need to start taking action now. One of the main causes of a confidence crisis is the condition of the skin on the body, and it’s no surprise. After months and months of being hidden away under numerous layers, skin may be looking a little worse for wear. Thankfully, it’s easy to get it back into peak condition and smooth enough to sustain a stunning suntan. Use Dermalogica The Ultimate Buffing Cloth in conjunction with Dermalogica Conditioning Body Wash during a bath or shower, for supple and soft skin. It’s always important to moisturise the entire body afterwards, as hot water can strip skin of essential moisture. 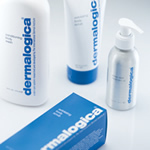 Dermalogica Body Hydrating Cream works wonders on all skin types, and will provide much needed rehydration. Now, all that’s left to do is go for a shopping spree for those all important bikinis!